WIC is your go-to resource for eating well, staying active and being healthy. WIC supports you with tips for healthier eating, breastfeeding and being physically active, along with providing wholesome food choices for your family. WIC foods are changing with the times, offering more whole grains, fruits and vegetables, lower-fat dairy and protein options. And, shopping for WIC foods at the grocery store with your eWIC card means choice, convenience and flexibility. Learn more about the many benefits WIC offers and get started with WIC today to learn more about eating well and staying healthy! There's no manual for motherhood. We've gathered information to create your own, including the tools you need to make healthy choices that work for you and your family. 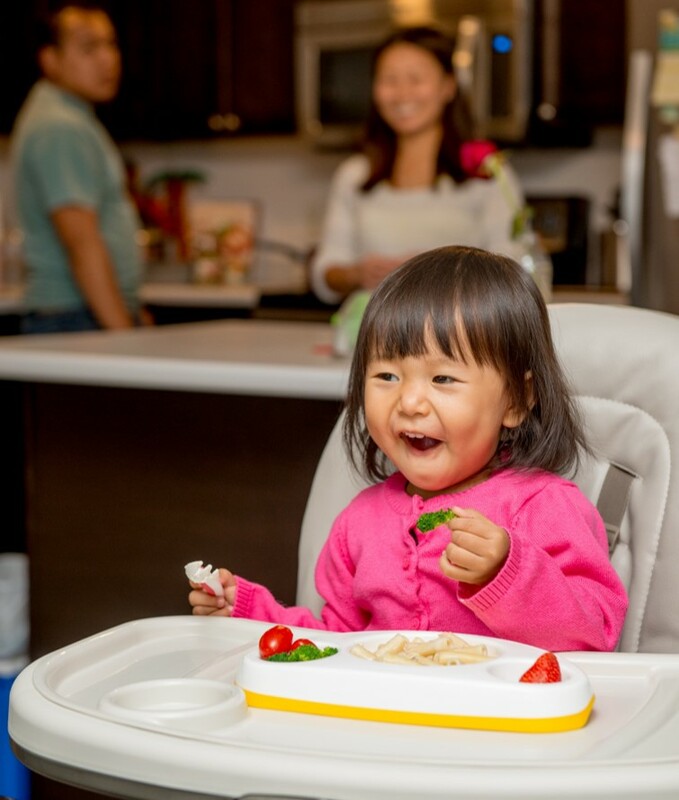 Nurturing your family's appetite for nutritious foods begins with breastfeeding and making your own baby foods, and evolves from cooking for your child to cooking with your child, handing down food memories and traditions along the way. Tell her how foods help her grow and make her strong. Grains give her energy to grow and learn. Whole grains have fiber to keep her healthy inside. Vegetables and fruits help her fight sickness and stay fit. Milk makes her bones and teeth strong. Meats and beans give her healthy blood and strong muscles. Best of all, show her by eating these foods too! Learn more about a variety of nutrition and health topics at WIChealth.org - WIC’s online nutrition education resource. Connect with your Local Health Office to set up an account using your WIC Family ID number. For recipes and cooking videos using WIC foods, check out WIC Health's Health eKitchen section. Need help making the most of your WIC foods? We've got the tools you need to incorporate wholesome WIC foods into your menus and to prepare healthy meals for your family. Our nutritionists can work with you to turn whole grain pasta into a dinner that your child will eat…and even love. Maybe you're looking for ways to work beans or more fruits and vegetables into your menus? We've got you covered! Check out the recipes below that use WIC foods, or call your Local Health Office to connect with a WIC Nutritionist for more ideas. When you select whole grains, choose whole wheat bread, whole wheat or corn tortillas, brown rice or whole wheat pasta. You can mix and match these choices up to the total number of ounces available on your WIC card each month. If you’re new to using whole grains, start by making simple switches. Try whole grains in place of refined grains products; whole wheat pasta in your favorite macaroni and cheese or spaghetti recipe. Or try corn tortillas for enchiladas and whole wheat tortillas for quesadillas. Canned or dried beans, lentils and split peas can boost nutrition and fiber in your recipes. You can choose between beans and peanut butter each month, so if your little one is tired of PB&J, try making black bean quesadillas or lentil soup to change it up! Make the most of your fruit and vegetable dollars. Choose fresh fruits and vegetables that are in season for the best quality and flavor. Stock up when the vegetables or fruits you use often are on sale, or when the large size bag is a better buy. For quick side dishes and less prep time, canned and frozen fruits and vegetables are convenient, easy to store and recipe ready. Purchase canned or frozen fruits and vegetables when they are on sale since they last a long time. Teach your child to love fruits and vegetables. Bring him grocery shopping and let him select a new fruit or vegetable to try. Cook together and show him child how to tear lettuce or add vegetable toppings to a pizza. Take fruit and veggie snacks with you on outings and keep cut up veggies in the refrigerator for ready-to-eat snacks. Let him child see you eating and enjoying fruits and vegetables for meals and snacks. Good and Cheap – Eating Well on $4/Day – a beautiful cookbook with recipes for healthy foods you can make on a limited budget. You can also find the recipes on the author, Leanne Brown's website. What’s Cooking? USDA Mixing Bowl – Search from a large selection of recipes, create your own cookbook, or watch videos to learn how to prepare heathy foods for your family. WIC Works Resource Center – Meal Planning, Preparation & Recipes - Links to a variety of websites and resources for menu planning and cooking. WIC Shopper App – Recipes – Find recipes that incorporate WIC foods. Access from your computer, or on your tablet or Smartphone using the WIC Shopper app that also comes in handy when you are shopping for WIC foods at the grocery store. The Fit WIC Activity resources are your guide to having fun with your child. The main idea is to play and be active everyday! Teaching play skills that support her growth and development and giving her opportunities to practice and improve her jump shot. Fit WIC also promotes getting to know places in your community where you can be active with your family. Build a lifetime love of being active - You got this mom! Fit WIC encourages you and your family to play every day with ideas for indoor and outdoor play, building skills, and finding new places to visit. Learn more about playing with your child and exploring your community with Fit WIC. 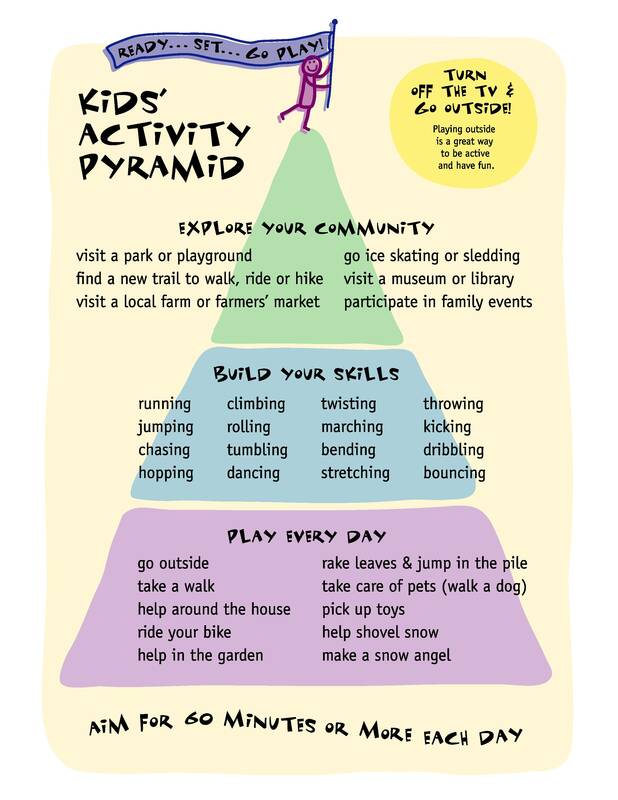 The Activity Pyramid is built on a foundation of everyday activities, from simply going outside to play and helping around the house, to walking the dog and raking leaves or shoveling snow. Try to get outside to play everyday with your child and to include him in a variety of helping activities that are part of your daily routine. Children need 60 minutes or more each day of unstructured playtime, where they are free to be active and use their imaginations. Just going outside is a great way to encourage this kind of play. The Everyday Activity Pages section of the book offers ideas for turning routine housework into a game.Take advantage of your child’s natural activity level by teaching him to help you inside and outside. Children like being helpful! . Start with the easiest ones for younger children and help your older child master the harder jobs. It's important to teach your child play skills that support gross and fine motor development. See the Skill Building Play section for ideas to make chores into something fun. Check out WIC's quarterly Fun and Games page. It feels good to be active. Small amounts of physical activity throughout the day add up; play several times each day with your child and you'll feel great too! Children like to be active — keep them moving as much as possible every day. Your child doesn’t need to play for 60 minutes all at once, most young children do best with shorter periods of active play throughout the day. This winter, plan for one hour each day to be outside; walk to your favorite skating park, build a snow person, or shovel a path to the woodpile and carry in some firewood. Remember - small amounts of activity throughout the day add up - you don’t have to be out for the whole hour at one time! Use your imagination to create new activities and memories! Preschoolers learn by moving, imitating and following examples. Children also need at least 60 minutes a day of structured play, where you are there helping them practice physical skills. In the middle section of the pyramid are ideas for helping your child learn specific skills, such as balancing, throwing, jumping and climbing. Plan for active time in your child’s day to help her develop play skills. Special outings can offer variety to your week and be fun for the whole family. Introduce your child to the local library to check out some new books, visit the farmers' market to find the first sugar snap peas, explore a new park in a search for the biggest slide or the greenest grass or attend a special event in your community. Break up the routine and have fun! Let's Move for information and support to help parents make healthy choices for their families and their communities. Choose books that tell a story about running and jumping, or suggest movement, such as dancing to stimulate your child's imagination and physical activity. Make up songs based on books with rhymes and clap out a rhythm. Explore titles at your local library and bring home a new stack each week. Offer your child a refreshing glass of water. Offer your child a favorite comfort. Offer to read your child a story — choose an old favorite, try a new story about growing food or cooking or share a family story about your favorite food traditions! Teach your child a special signal that lets her know it’s time to cool down — this could be clapping your hands, holding up 2 fingers in the air, or singing a familiar song like “Twinkle, Twinkle Little Star.” Use this signal every time it’s time to settle down. Childcare providers (and parents, too!) can learn more about healthy eating and physical activity by going to our Child Care and Early Learning page. Fit WIC encourages your family to play everyday! We can’t wait to see how they grow! WIC’s quarterly newsletter "Growing Healthy Families" includes tasty recipes, answers to health questions, tips for being active, WIC food updates, and more!